The experts at York Safety Solutions are dedicated to helping all industries find an unmatched level of safety and health across the board. However, some industries may not know exactly where to begin or how exactly to implement certain health and safety standards to be OSHA compliant. Our consulting services can be an excellent starting point. Our efforts and consulting capabilities can streamline your current safety practices and expand on the efficiency of your safety training for employees. York Safety Solutions can devise effective Health, Safety and Environmental plans specific to your general industry and construction site needs. The basic and necessary purpose of a current and all-encompassing HSE plan is to outline specific rules and regulations relevant to your company and facility. The plan gives a comprehensive guideline so proper management and accountability of all health, safety and environmental issues can be guaranteed. The standards of practice outlined in a professionally designed HSE plan will outline the responsibilities of everyone involved with your facility or site, including suppliers and vendors and make expectations clear.Our HSE plans explicitly define appropriate corrective and preventative measures for various situations or issues that may arise. The health, safety and environmental plans you utilize and implement should also include detailed emergency and injury management plans. The ultimate goal of health, safety and environmental plans is to help your industry obtain an injury and accident-free status along with assisting in the creation of a reliable and sound plan to handle any emergency that may unexpectedly arise. The health and safety industry is evolving and there are always updates and ways to improve upon any safety record. At York Safety Solutions, we can devise and implement a Health, Safety and Environmental plan that evolves when you need it to and serves to better help you reach a level of compliance you can be confident in. Even though there are many regulations and safety and health standards that are practiced in a wide variety of general industry and construction, each job, each site and each facility have individual aspects that set them apart. This is why health and safety plans can’t be one-size-fits all. Because we understand the differences and individual needs that encompass general industry and construction, we design and implement job specific plans that can meet all of your health and safety needs. The job specific plans implemented by York Safety Solutions can help every member of your team conduct themselves and their job under the umbrella of full OSHA compliance. The individual responsibilities and regulations that affect and pertain to a foreman on one site can be vastly different for another. There is also a notable difference in the level of responsibility and knowledge base of a new employee compared to a supervisor. At York Safety Solutions, we customize job specific plans for compliance and health and safety to meet your individual needs and requirements for all levels of employees and work environments. For the optimal level of safety and health, along with a notable decrease in the instances of injury, accident, or OSHA citations, it is imperative that any industry obtains job specific plans from health and safety experts. The experts at York Safety Solutions can meet your industry’s job plan needs and help you achieve the highest level of health and safety excellence. Maintaining OSHA compliance in regards to emergency plans and evacuation plans is imperative for any workplace environment. That compliance is vital to ensuring the health, safety, and overall welfare of each and every employee. Not having a clear and properly understood plan is in direct conflict with OSHA safety and health standards. The consequences of an unclear, non-existent, or non-compliant emergency and evacuation plan can be far-reaching, even deadly. The professional occupational health and safety specialists at York Safety Solutions can create and help your site or facility implement a clear and comprehensive plan for evacuation and emergency procedures. One common aspect of an evacuation plan specific to fire is the use of suppression devices or substances. Proper training, maintenance, and access to these materials and devices is an essential part of a compliant and clear emergency and evacuation plan. Having easy to understand expectations and recognizable alarm systems are also vital. We can train employees and properly outline the best strategy and procedures to handle any kind of fire or explosive incident. Evacuation and emergency plans entail more than fire suppression. A detailed route and clearly defined safe areas are a necessary component to an evacuation plan also. In the event of an evacuation, every employee on every level must be aware of their expected actions during and after any given situation. This may entail communication channels and changes in hierarchy in an emergency or after workers have gathered at a safe spot. The incidents of workplace violence have highlighted the need for clear plans of escape and self-protective measures. We can assess your site or facility and best outline a plan that can help maximize the safety and protection of everyone involved. While there are a wide variety of reasons for evacuations and emergency plans to be executed, all emergency or evacuation situations have the same things in common; that is the fact that chaos, confusion and disorganization is the worst reaction for any workplace. Having a solid evacuation and emergency plan is not just about OSHA compliance; it’s about protecting and safeguarding your facility, your site, your equipment, and your most valuable asset—your employees. Having the team at York Safety Solutions as your partner for OSHA compliance and workplace health and safety programs shows your employees, your clients, and your insurance company that you are serious about providing the safest and healthiest work environment possible. Our program management tools and capabilities can help any general industry and construction operation meet all codes and regulations to stay OSHA compliant. York Safety Solutions will conduct on-site meetings, review inspection reports, analyze citations, and adjust safety and health practices accordingly when needed. We are able to conduct training, provide valuable oversight, and measure current compliance so your general industry or construction site can maintain the standards of excellence necessary to keep time-loss costs down, OSHA citations down, injuries and worker’s compensation costs down, insurance rates down, while keeping productivity and trust up. Our program management capabilities are competitively priced and an investment that will pay off as your company achieves the highest level of health and safety in your particular field. Workplace policies and manuals need to be clearly defined to be put into action by all employees. There is no room for vagueness, confusion, or misinterpretation. There is also a need for expectations and standards to be job and industry specific. At York Safety Solutions, we can create policy outlines and safety manuals that are custom designed for your particular situation, facility and site. From training new employees to clearly defined expectations of supervisors, our policy and safety manuals cover the full gamut of a particular general industry or construction site. We can create classroom manuals that can be utilized by those in a particular job or also for company-wide use and reference. York safety Solutions will compile the latest OSHA regulations and standards, instruct employees on all levels, and ensure all policies and safety guidelines are clearly defined and understood. All aspects of your health and safety policy manuals and instruction can be effectively handled by York Safety Solutions. Our team of highly trained experts will visit your site or facility and evaluate where you should be pertaining to certain safety and health standards. We can then help you navigate the process of implementing our suggestions, policies, and plans to make sure every aspect of your company or facility is up to code and compliant with current standards. We are able to formulate a plan that can be immediately put into action and construct manuals for employees and employers for future use. Our consulting services are a proactive approach to instilling safety and health measures that protect your business from costly fines, rising insurance costs and lost time due to worker injury. As work environments change, so do the methods of being complaint and areas that may need improvement and guidance. We are able to tackle workplace specific issues, such as workplace violence, and develop an individual approach and plan that meets you particular needs. We can essentially consult on a wide range of possible health and safety issues before they become a costly or dangerous issue for your company. 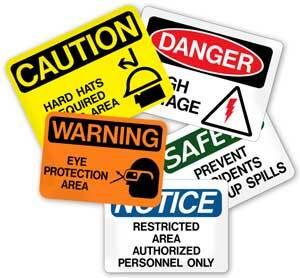 If you have an OSHA citation, our consultants can help you fight it and also prepare you for full future compliance. Even if you are free from fines or citations, there is always room for improvement. Let York Safety Solutions conduct an evaluation of your construction site or facility and consult on where and how specific improvements can be made. Our goal is to help our clients consistently live up to our standards of safety first, never last, have a future, not a past.